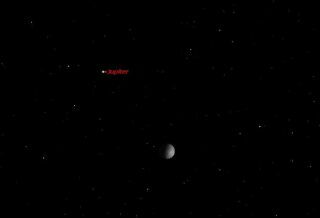 Jupiter will shine near the moon in the night sky Saturday, May 14. Saturday evening, step outside and enjoy the rendezvous of two of the brightest objects in the night sky: the moon and Jupiter. About 45 minutes after the sun sets tomorrow (May 14), the eye-catching celestial duo will be visible high in the southern sky, roughly two-thirds of the way up from the horizon to the point directly overhead (called the zenith). On Saturday, the separation between the moon and Jupiter will have shrunk to about one-quarter the distance it was Friday night; the moon will have increased to a waxing gibbous phase, 64-percent sunlit, and will be sitting just a few degrees to the lower right of Jupiter. The pair will no doubt make for an eye-catching sight even to those who aren't paying much attention to the sky. But even without the moon, Jupiter readily attracts attention: At about magnitude minus 2, the gas giant outshines everything in the night sky except Venus and the moon. These days, Jupiter first comes into view high in the south during the early stages of twilight and sets at around 2:50 a.m. local time. In a telescope, Jupiter is a prime attraction, best observed during early evening, when it's still high and its image reasonably calm. The giant planet appears as a great, big, belted ball with tantalizing glimpses of detail. Admittedly, Jupiter currently appears only about three-quarters as large as it did at its opposition on March 8, but don't let that stop you from searching for the planet. The quirks of atmospheric conditions, which can change from minute to minute, often make a bigger difference in what a telescope will show of Jupiter than the planet's apparent size does. And Jupiter's four bright Galilean moons (Ganymede, Callisto, Io and Europa) are always performing. Finally, note that Jupiter is now about three and a half months away from a spectacularly close conjunction with Venus, which will occur on Aug. 27. Editor's note: If you capture a great view of Jupiter near the moon on Saturday and would like to share it with Space.com and our news partners for a potential story or gallery, send photos and comments in to managing editor Tariq Malik at: spacephotos@space.com.